MWC: Nokia 808 PureView offers Dolby Headphone surround sound and '41 MP' camera | What Hi-Fi? Nokia has launched the 808 PureView, a new Symbian smartphone that it claims will be "the next breakthrough in photography". Sporting a '41 MP sensor' and a Carl Zeiss lens, the Nokia 808 PureView is also the first mobile to come with Dolby Headphone to offer surround sound from standard stereo headphones. 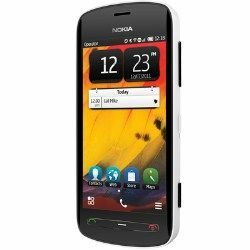 The new Symbian mobile also promises to record clear sound without distortion at up to 140 decibels. Nokia announced the 808 PureView at the first press conference of the day here at Mobile World Congress (MWC) in Barcelona, at the same time as confirming that the flagship Lumia 900 will come to new territories after launching in the US earlier this year. Also new was an entry-level Lumia smartphone, the Nokia Lumia 610, which is set to go on sale in Q2 for around 189 euros. The Nokia 808 PureView has a 4in screen, 16:9, 640 x 360 resolution screen, an HDMI output, Bluetooth 3.0 and DLNA. The 41 MP sensor allows for extra zoom functionality, promising greater detail from still images. There's also full HD video recording. The smartphone has a 16GB internal memory plus an SD card slot for expanding the storage capacity further.